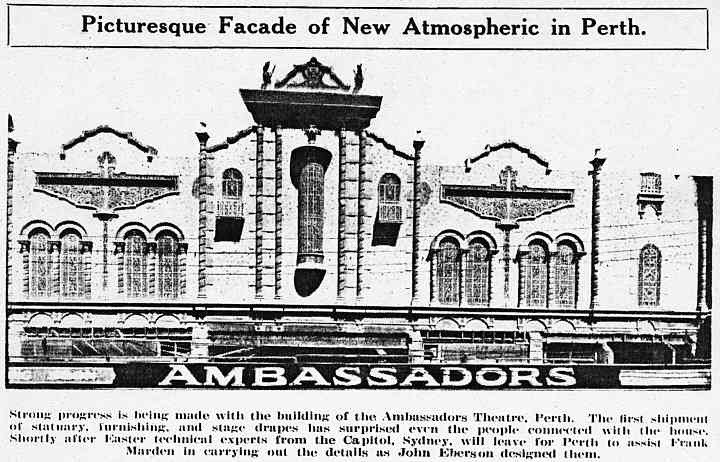 The 1993-seat Ambassador's Theatre, Perth, was Australia's second "atmospheric" theatre; it was preceded by the Capitol, Sydney, which had opened earlier in 1928. 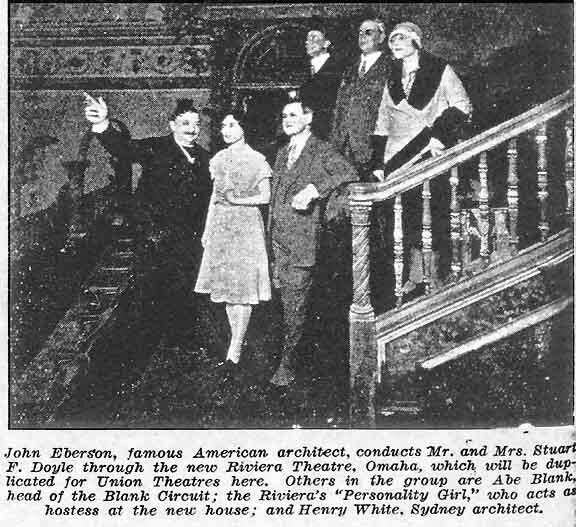 Stuart Doyle, Head of Union Theatres, had visited America the previous year earlier, and had imported the designs from John Eberson; they were adapted as necessary by Union's architect Henry White. 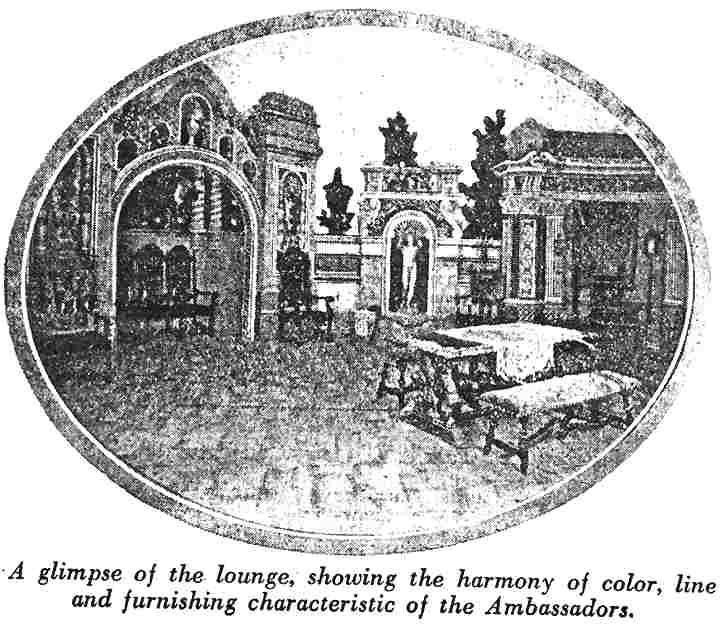 Henry White certainly did not have much time to prepare the design for the Ambassador's, for only two months after inspecting the Riveria Theatre, Omaha, plans were ready for both the Capitol, Sydney, and the Ambassador's. 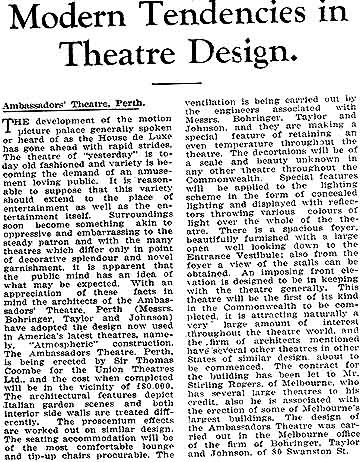 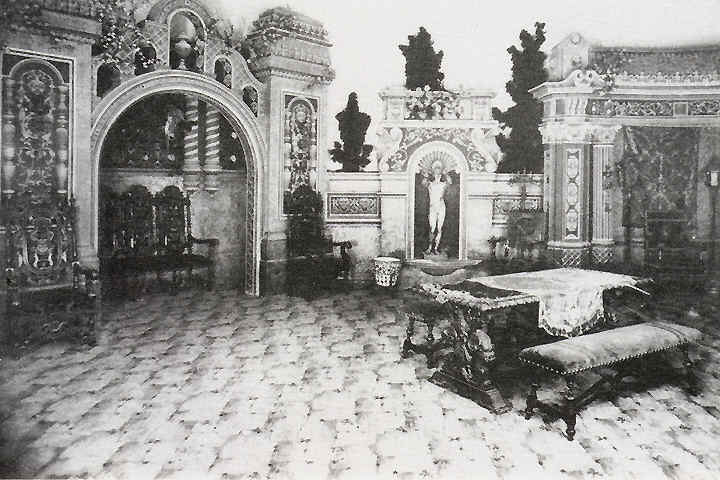 The theory that the interior designs were imported from Eberson's office in their entirety and merely tweaked as necessary for their Australian locations, thus seems entirely credible. 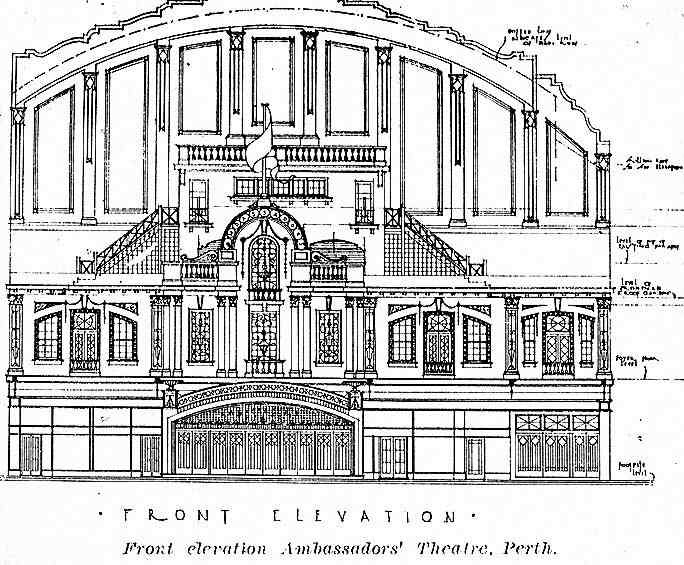 The external facade that was built was different from that shown on the plan above. 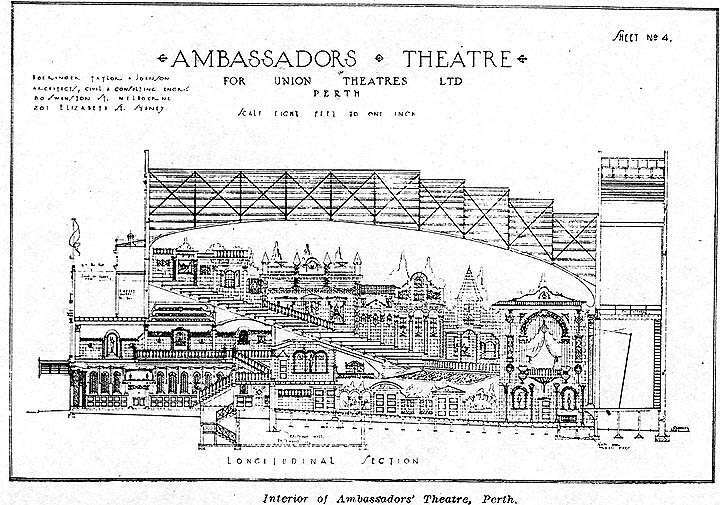 The Ambassador's organ was described in the theatre's opening brochure as being" the largest Wurlitzer in Australia". 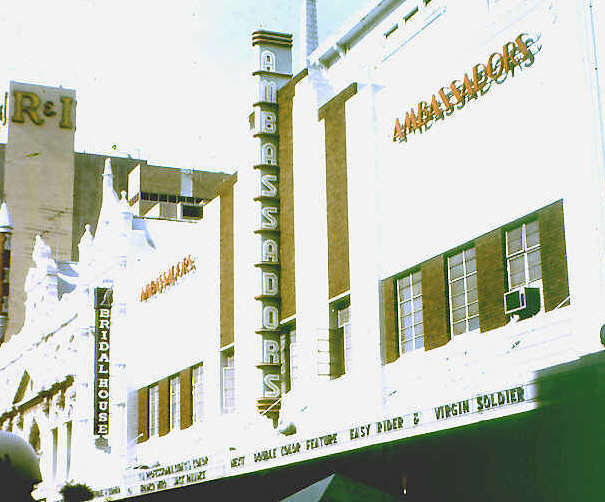 [Ross Thorne, "Cinemas of Australia via USA", p. 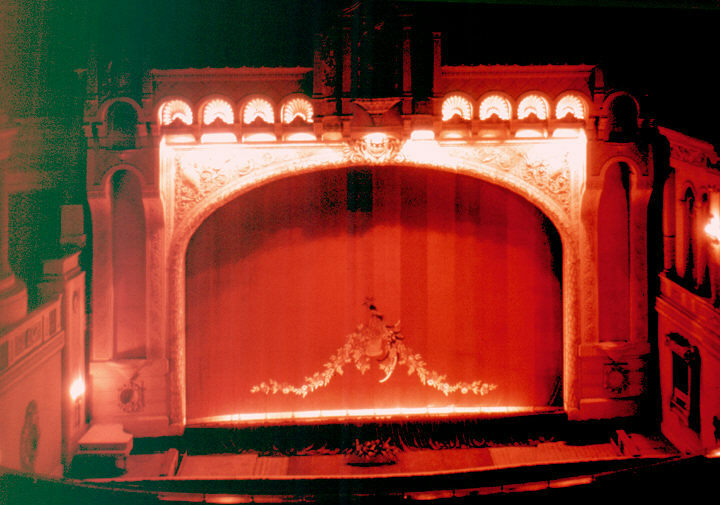 75.] 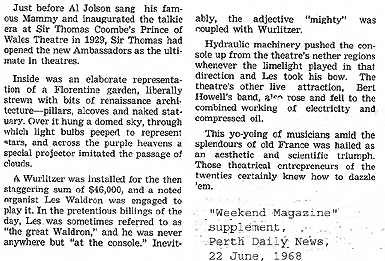 This was technically correct, in that it was equal in size to the other Style 260 organs already playing at the Capitols in Melbourne and Sydney and the Regent in Adelaide. 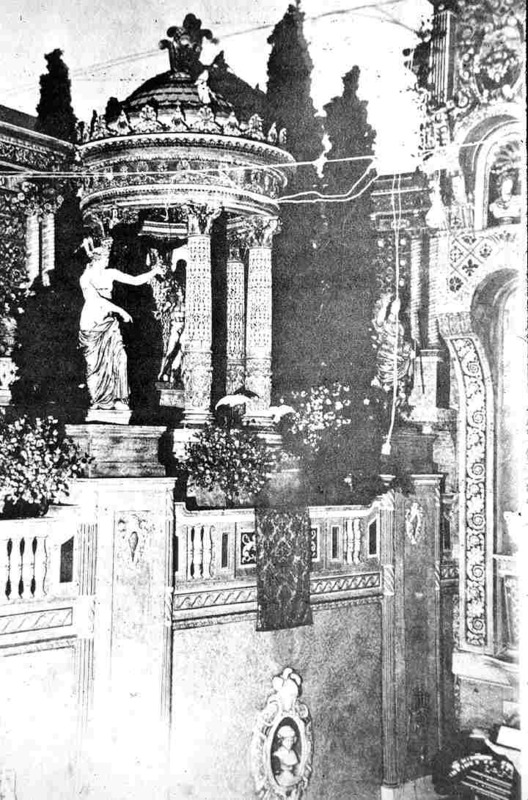 The organ was Opus 1902, a Style 260 Wurlitzer, with fifteen ranks of pipes and a 3-manual scroll-style console. 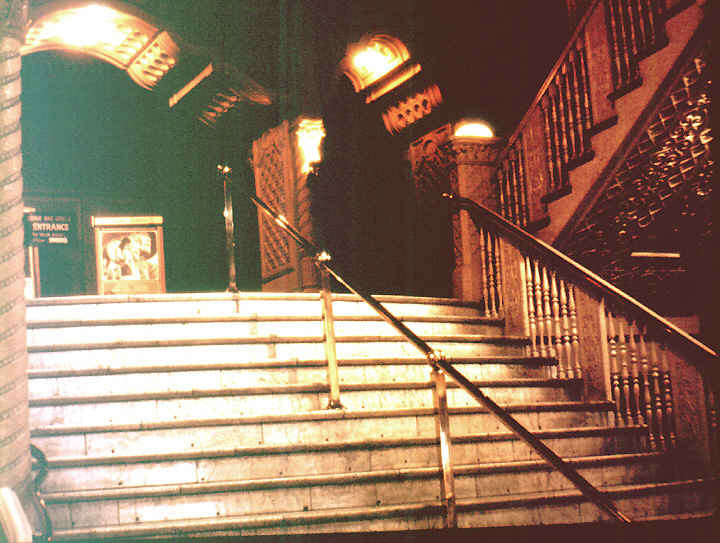 Its specification may be found here. 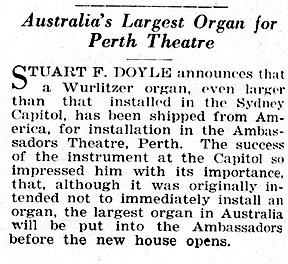 It was the same as the organ at the Capitol, Sydney, in the latter's original form. 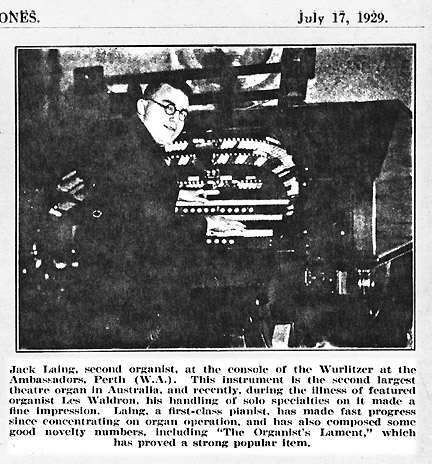 As reported above, Leslie Waldron was the opening organist, whose performance of "The Lost Chord" was well received by the audience. 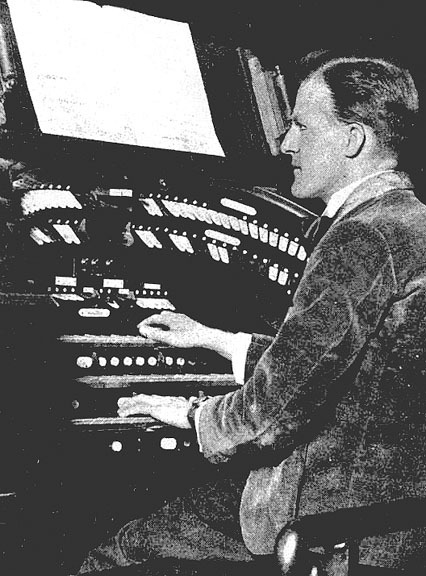 Subsequent organists included Bernie Randall, Jimmie Miller and Reubert Hayes. 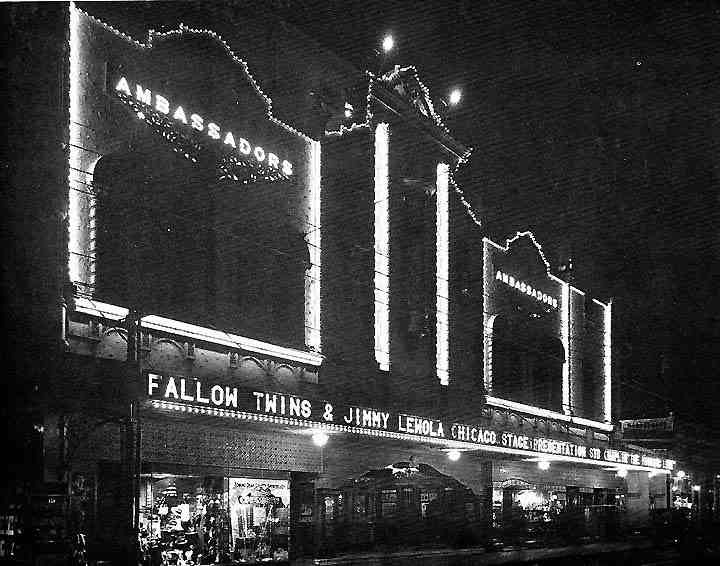 [Max Bell, correspondence 30 October, 1975] During the 1930s, organists frequently "doubled" at the both the Ambassador's and the Regent. 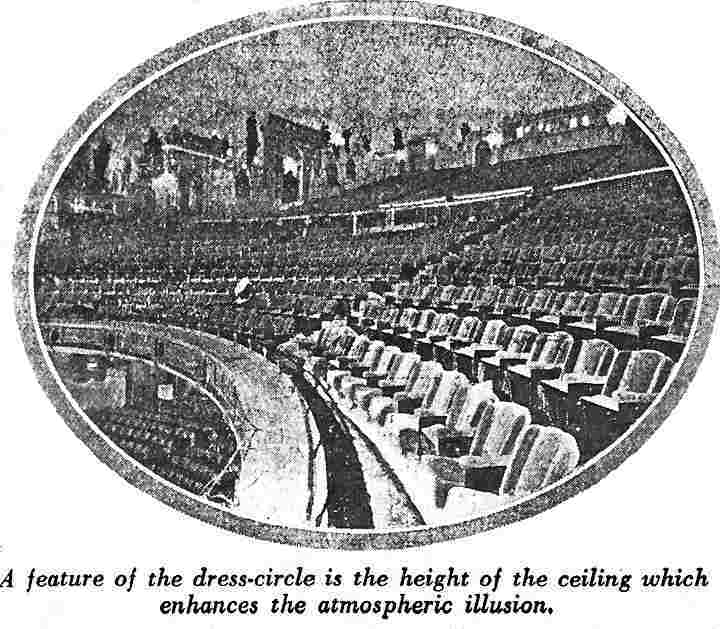 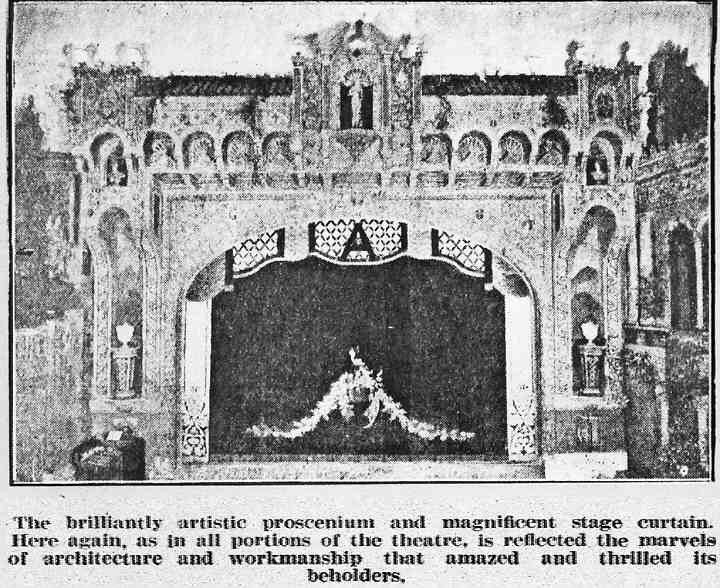 Hoyt's did not have the same affection for atmospheric theatres as did Union, and in 1938, much of the interior fittings disappeared. 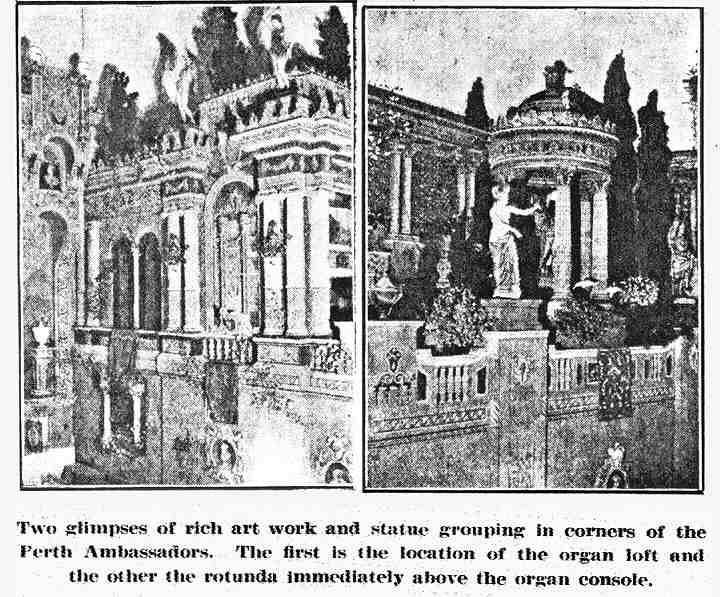 Virtually everything that was not a permanent fixture - doves, statues, etc. 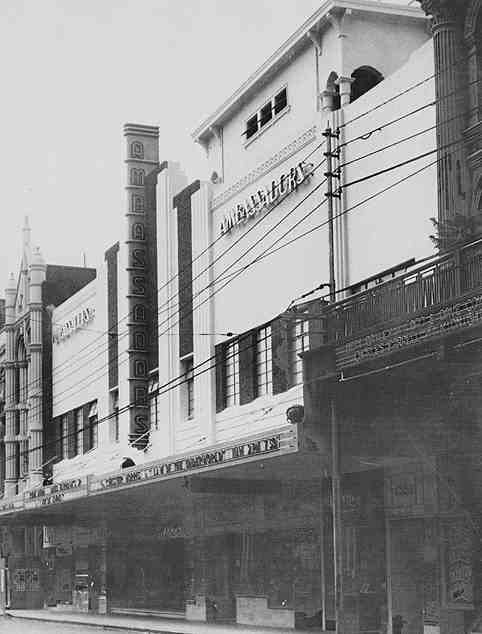 - was removed. 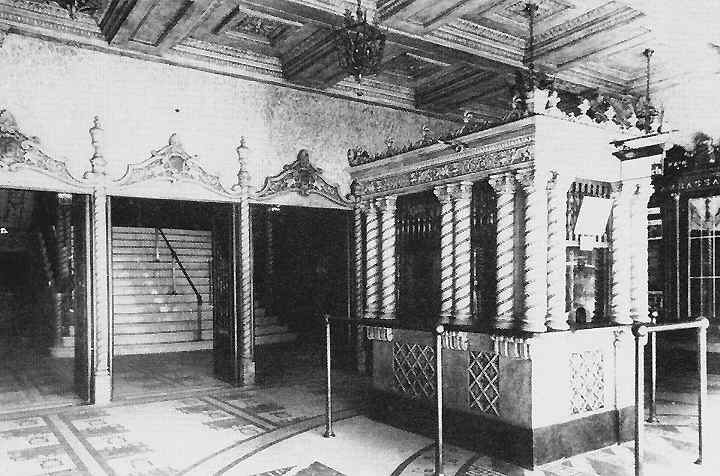 At the same time, the exterior was redesigned in "moderne" style. 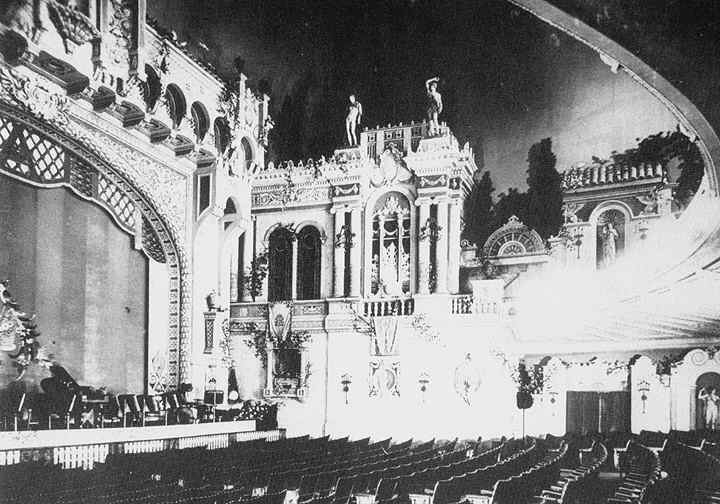 The organ remained until 1946, when it was removed and used to form the core of the new instrument built for the rebuilt Regent, Melbourne that opened in 1947. 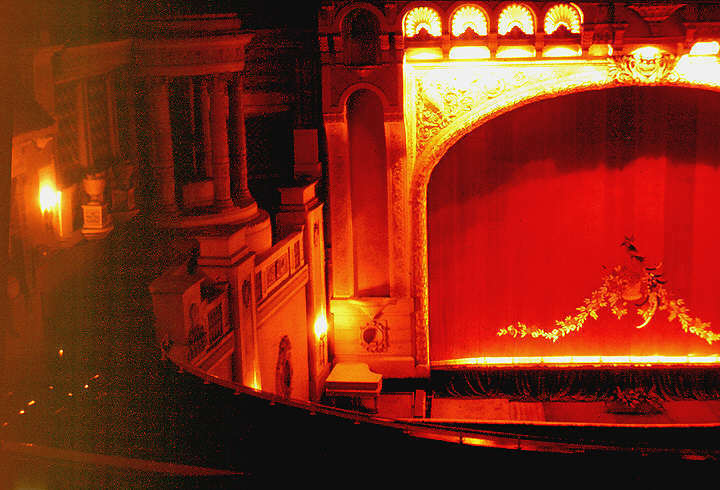 A grand piano was placed on the organ console lift platform. 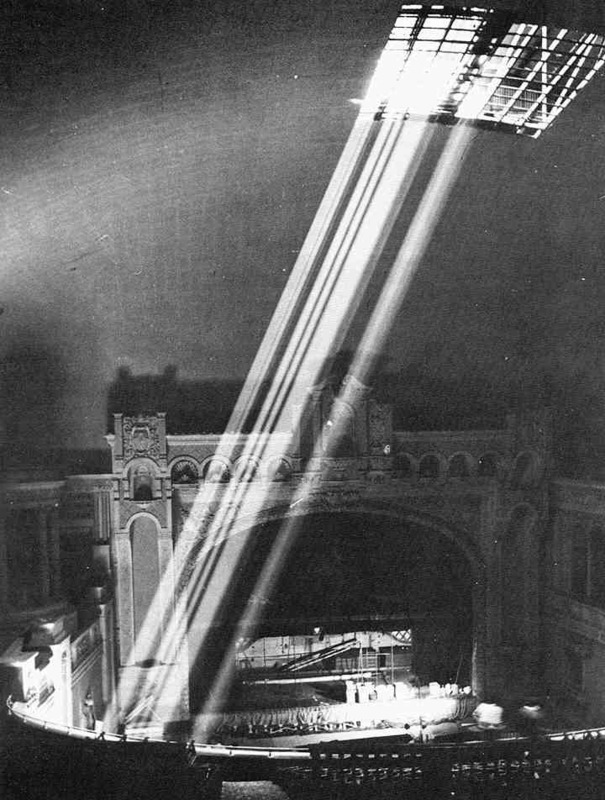 Below - a ray of sunlight, created by the demolishers, takes the place of the starlight created by Eberson and White - a final view of the Ambassador's auditorium.